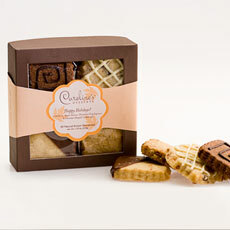 Put a twist on tradition with our Happy Holidays Shortbread Collection. Wrapped up and ready-to-give, this stylish gift includes a scrumptious assortment of fall favorites. Includes: Cranberry, Chocolate Chip Espresso, Maple Walnut and Chocolate Dipped Traditional.